Since the first publication on the HPO Framework in 2007, many organizations worldwide have worked with the HPO Framework, and many new research studies have been based on the framework. This made it possible to evaluate the financial and non-financial benefits that applying the HPO Framework can bring to organizations. A better employee attitude. Employees feel and take more responsibility for improving the organization’s products, services and processes. They take more initiative and the degree of innovation increases. More new products and services are brought to the market place, in shorter time spans. There is also a more positive mentality and higher engagement. Better cooperation inside and outside the organization. Employees cooperate more and better, both internally with colleagues of other departments as externally with suppliers and customers. They are more open to ideas from other people and they see themselves as part of an organizational value chain which has to function effectively along all its links. There are better and more frequent dialogues between managers and employees, and also between organizational units. A better organization. The organization has a more unique strategy compared to its peer group. This uniqueness can be found either in the content or the execution of the strategy, and often in both. This sets the organization clearly apart from its competitors, which raises its attractiveness to new customers and potential employees. There is more focus and discipline. Employees also feel a strong corporate social responsibility. This makes that the organization enjoys a better reputation both in the business community and in society in general. Better financial results. The above mentioned non-financial benefits translate into clear financial benefits. Productivity increases as the same people do more, with more success. Profitability also increases as costs are lower and turnover is higher. As a consequence, as the organization rises towards the top of the sector, its market share keeps on growing. Finally, as costs and budgets are better under control, the financial situation of the organization improves and stabilizes. 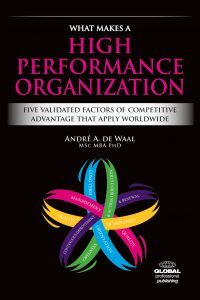 organizational units when these are compared to each other: the units with the highest average HPO scores also have the best financial performance of all the units, and vice versa.